A Beautiful Garden AND Time to Smell The Roses? I love my garden, but I'm hardly a gardener. If you were to describe my gardening thumb, you wouldn't say it was green...more like a barely alive shade of brown. That doesn't make me an authority when it comes to the "how to's" of plant care, but it does make me an authority when it comes to how easy it is to have a beautiful garden that requires little maintenance and attention (aka gross negligence) and that can save you money at the same time. I can't say enough about the benefits of making room in the yard or balcony for perennials. These plants are hardy, come in a variety of colours, blooming cycles, sizes, shade/sun tolerance and watering needs. We jumped right in when we landscaped our yard ourselves, with nothing but trees, shrubs, perennials and wood chips. We also built a pond but we know that's a bit extreme for most landscaping projects. In the first few years, we complemented with annuals, but soon realized it was hardly required as the perennials quickly grew into their allocated space. In fact, looking back, we now think we weren't generous enough in our spacing. Why do I like perennials so much? They last more than one year. Best of all: They can save you a lot of money! If you plant perennials with care and provide the roots with shade in the form of wood chips to retain moisture and protect them from the sun's heat, you won't be disappointed with that time investment. They may not grow as quickly, but they do fine without the bi-weekly watering. I will confess to you right now that about 5 years ago, I decided that if any garden plants needed to be watered on a regular basis, they weren't the right plants for our yard. I am happy to report that I have yet to water an outdoor plant that is not potted. All the plants are doing fine. They don't need weekly maintenance. and pruning, which we do every Spring and Fall. That means we spend more time enjoying the plants and less time, money and energy caring for them. Perfect. If they can grow here, they can grow anywhere. We live in a zone 2 climate. It's harsh to say the least. 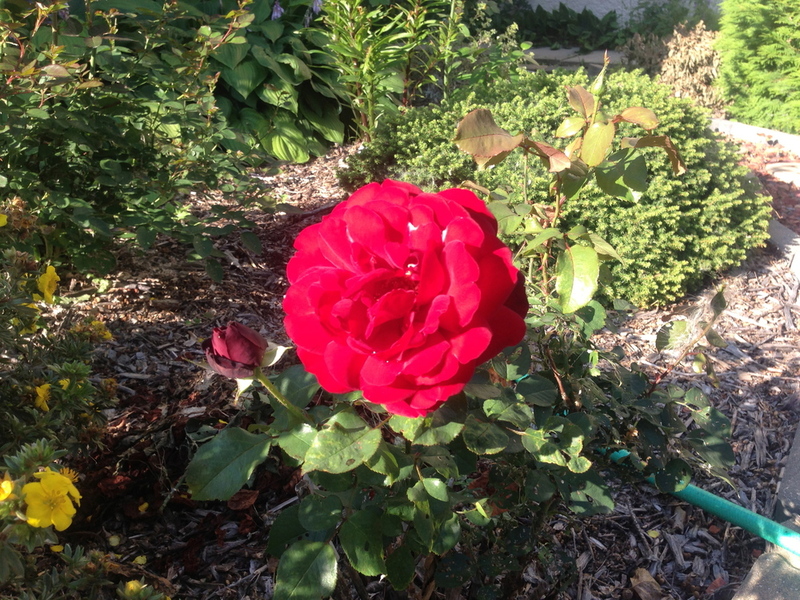 Despite this, our plants thrive, including our rose bushes! That being the case, you can find plants that are hardy for your area, no matter where you live. Any assortment of perennials can be made into beautiful natural-looking landscape. The idea that you plant it and forget it, other than occasional weed control, is very satisfying. They make your environment more beautiful and you don't have to start from scratch every year. Our garden is now over a dozen years old and the investment is really paying off in terms of maturity and health of our greenery. There are a few plants I enjoy that are not hardy enough to stand the zone 2 Canadian winter. These include begonias and ivy (see picture on right). These I keep in hanging baskets on the porch and overwinter indoors. The begonias go dormant and the ivy just keeps growing, making it more lush and beautiful every year. I don't do anything special. I just bring the pots indoors and water once a week. Daisies - They grow like weeds! Strawberries (lower left) - They multiply assuming their daughter plants can gain a hold of soil nearby. I'll let the plants speak for themselves on this one. Here's a sample of pictures, the top three of which I took this week. 5. They save you MONEY! The only significant expense we had was at the outset. With a large portion of deck, pond and wood chip for walking, the perennials, trees and shrubs were less expensive than planting grass, so the initial investment was about $1,000, not including the expense for building the deck or the pond. I have to say though that if we had not built the pond, that section would simply have been wood chip and perennials anyway. That expense was before we were as savvy as we are now about money (and hopefully we will keep improving in that department). If we were to start now, we would be looking for perennial owners who are interested in sharing or trading plants. They're easy to find on resale sites or in your own neighbourhood. I figure we could have the same yard greenery now for about $300. Lesson learned. Last year, we saved over $250 in groceries and that's a light estimate. We ended up with 70lbs+ of berries (Nanking cherries, saskatoons, raspberries, strawberries and blackberries) and more than double that in apples. We also have a cupboard full of herbs year round. The savings estimate above is based on the berries alone and don't include the apples or spices, We give away most of our apple harvest as opposed to freeze them as we do our berries, given we're not big apple eaters. We certainly do build good will with friends and neighbours though because they are tasty ;). We don't have a vegetable garden at this point, but I have to say we're pretty pleased with what we can produce for the time being. We also swap with our next-door neighbour who has an abundance of veggies to share with whoever's hungry. We're definitely the winners in that exchange, but they seem more than happy to help us stock up on the good stuff. Our Nanking cherry harvest last year = 22lbs. Saskatoon berries this morning. They're ready for the picking and we have to hurry before the birds notice! Parsley. Perfect garnish for dinner plates & tasty too. As mentioned above, we have no grass and so no mower. That means no initial outlay, no gas or electricity cost and no equipment maintenance cost, not to mention reduced impact on the environment. We replace our gardening shears and gloves every few years at a cost of about $15. The wood chips we get are virtually free, thanks to some local programs. If we do end up buying it, it's inexpensive, as we choose the lowest grade available. We also don't pay for water, fertilizer, week killer or bug deterrents. If we want to give our plants an occasional boost, we may take water from the pond before an expected rainfall, given the pond water is a natural fertilizer*. I call that bang for our buck. We enjoy perennials both outside and inside. When we're invited out to dinner or for some other special occasion, I like to bring a gift. In the summer, it's flower bouquets. They cost me nothing but the time to pick the flowers and make the arrangement, which I enjoy doing, and sometimes a $1 or $2 vase from the Thrift Store. I also make flower arrangements for our home if we're expecting company. 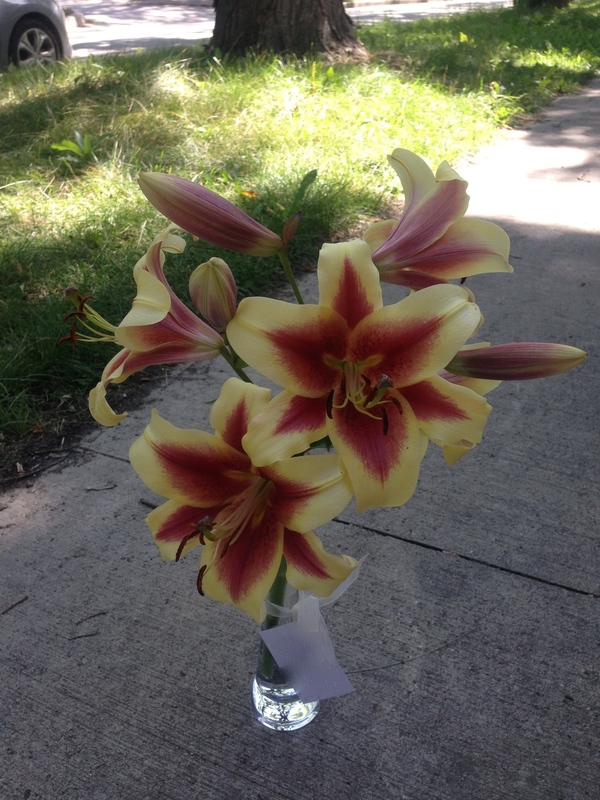 Our stargazer lilies have even served as a flower arrangement for the head table at a wedding a number of years ago! Here are a few pictures of some of the bouquets we've made for our home or given away in the past year. I love being able to give away bouquets you can't find at the store. A gift for a bride whose wedding we could not attend. The bouquet currently on display in our home. A "just because" bouquet for mom. If I can pull this off, anyone can. It's overall good fun, doesn't take much time, and it's quite satisfying. Are you already a gardener and have said "yeah!" throughout this post? If not, are you thinking of some possibilities for your own green space(s)? 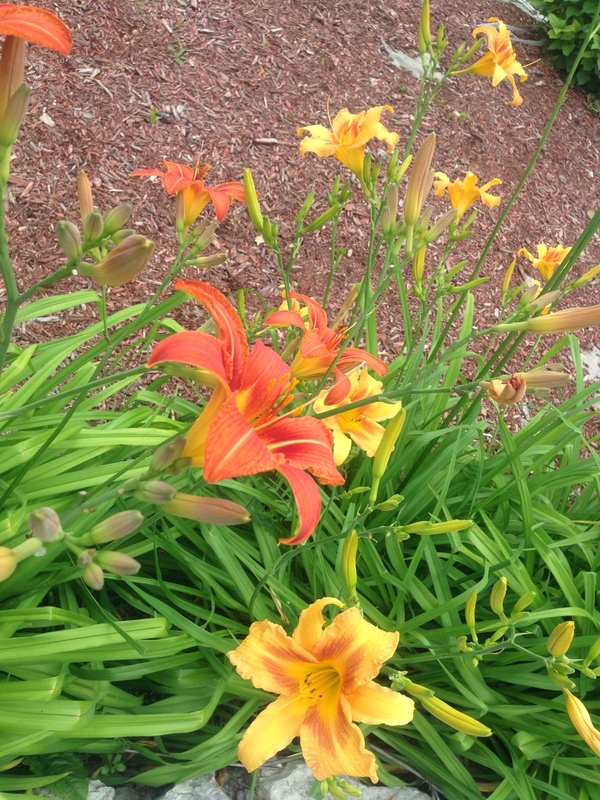 I'd love to hear your thoughts on the link between gardening and frugality. *The pond has no water pump anymore. My hubby rigged the pond with a rain water & overflow system that makes it take care of itself. Genius!